Tax receipting time is right around the corner so I wanted to remind you that you should be working towards completing your records for submission over the next few weeks. Here are some of the things you need to keep in mind. Every receipt has to have the complete full legal name of the donor. It also has to have their correct address. If you don't have time to do this perhaps assign someone in the church to follow up. Without this information we cannot give you a receipt for a person. This is a good time before Christmas to do this. It is your responsibility as the pastor to supply us at the national office with the information on what each member gave each week during the year. We do not track this at the office. Please make sure your records are correct because we do choose a few examples from the church to audit with the records we have been given throughout the year but we can't do everyone. Please have this up-to-date. If you have problems contact us ASAP. The last day that you can submit offerings this year will be for those deposits made before the end of the year. Since the bank does not count the last day of the month, only deposits made by December 29 will be receipted it. All this being said, most of you should be able to complete your list between Christmas and New Year's, or during the first week of January. You will have all of your information in hand by then and if you are well prepared you can get it in early. Please remember the value of helping us get the receipts out as early as possible. Donors really appreciate it when they get the receipt early rather than late. 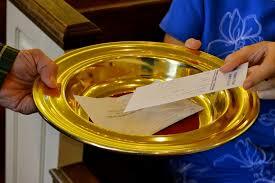 Every year there are donors in churches that reevaluate whether they want to give to you next year if they get a late receipt and it holds up their income tax report. Although receipts do not have to go out until the end of February people do appreciate getting them early. Finally, check and recheck and send in the right information. It can be very frustrating to a donor to get a receipt with their name, address, or amount incorrect. When there are mistakes donors always feel that you don't care or appreciate their sacrifice. Start preparing a letter to say thank you. It should be from you personally. It doesn't have to be a different letter for each person. It can be a form letter, but you should do it well. Do you need you can talk about what the Lord has done over the year, about his faithfulness, about the progress the church has made, the testimonies they have heard, and the challenge for the next year.